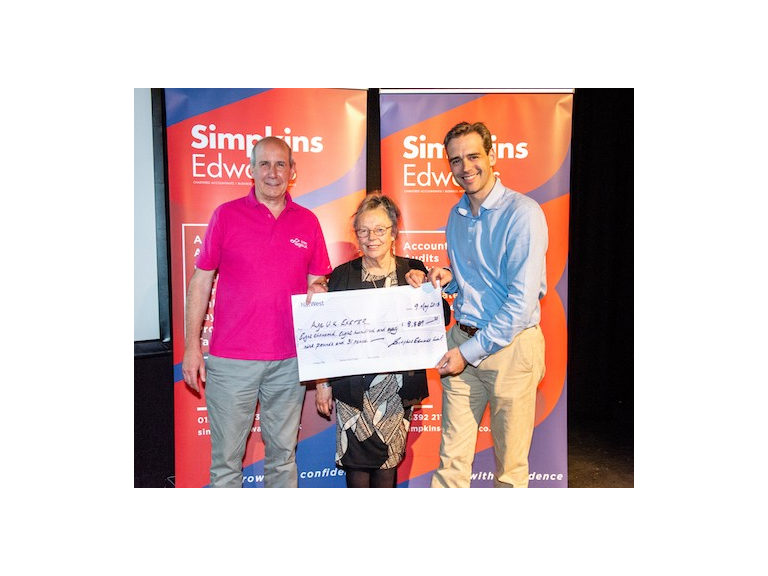 Exeter’s 15th annual Really Big Quiz, organised by chartered accountancy firm Simpkins Edwards and held at the Corn Exchange, has raised an all-time record amount for the Lord Mayor of Exeter’s charity of the year. Beating the previous record of £8,141 set in 2015, the event, which is one of the highlights of the Devon business calendar, raised £9,174 for Age UK Exeter. The quiz, which took place on 9 May, saw a packed hall of 73 teams fight it out for the title of Exeter’s brainiest eggheads. Simpkins Edwards’ very own John Humphrys and Jeremy Paxman - partners Adrian Hemmings and John Coombs - put the teams through their paces with a host of devious questions over eight rounds. At the half way point, renowned auctioneer James Morrish of Kivells whipped the room into a bidding frenzy with the top item for the night - a tour for 20 at Exeter Brewery including food and beer tasting - going for £450. Money raised from the auction, the raffle, a hilarious round of heads and tails, entry fees, and an injection of £2,263 from unclaimed client funds donated by Simpkins Edwards, helped beat last year’s total by £1,570. The total included a record breaking £1,470 raised by the raffle. This enabled the Lord Mayor to present a cheque toAge UK Exeter for £9,174, helping to support the work of over 280 volunteers and 100 staff who deliver services and support to over 12,000 elderly and frail in the local area every week. The champions on the night were On Your Marks, who came third last year. Winning by a single point from 2016 winners ATASS, the team from St Mark’s Church collected the Really Big Quiz trophy for the first time since 2012. Last year’s winners, First Data Bank, came in a well-earned third place. Commenting on the success of the event John Coombs, Partner at Simpkins Edwards, said: “Once again, the Really Big Quiz has brought businesses and teams from across the county together to help raise a tremendous amount for a very worthy cause. Through their generosity we’ve smashed the previous highest total, which means that £9,174 will now go to this year’s Lord Mayor’s charity, Age UK Exeter. Lord Mayor of Exeter, Councillor Lesley Robson, commented: “I would like to thank everyone that attended the Really Big Quiz. Their fantastic support for Age UK Exeter will help make a significant difference to the lives of thousands in the local community. RBQ Cheque Presentation: Martyn Rogers, Chief Executive Age UK Exeter; Lord Mayor of Exeter, CouncillorLesley Robson; Adrian Hemmings, Partner, Simpkins Edwards. Winners – On Your Marks: St Mark’s Church (l-r)– John Coombs, Partner, Simpkins Edwards; Andrew Turner; Rab Cross; Dana Higgins; Andy Bee; Helen Nash; Adrian Hemmings, Partner, Simpkins Edwards.